Air Asia Red Hot Sale tickets 2017 to 2018 will soon be available! Check the promo details on this post such as the covered destinations and red hot promo fare ticket rates! As low as P16 domestic Air Asia promo fares are up for booking during the sale for trips from Davao to Clark and Cebu; Kalibo to Clark and Clark to Kalibo and Davao. Lowest promo fare from Manila is P799 sale ticket to Cebu. As for international trips, promo flights start at P999 for Manila to Taipei route. Sale tickets to Hongkong, Macau, Kota Kinabalu, Kuala Lumpur and Shanghai are also for grabs. BIG members can book now, March 12, 2017. They are given 24 hours Priority Booking or get seats by redeeming their BIG POINTS. For the public, the Air Asia Red Hot Sale 2017 to 2018 will be open for booking at 12:01 March 13, 2017 until March 19, 2017. Promo tickets from this sale are good for travel from September 1, 2017 to June 5, 2018. Air Asia Red Hot sale tickets are available on selected dates only. Quoted Air Asia red hot sale tickets are good for one-way trip. Book your Air Asia red hot promo fare via www.airasia.com or mobile.airasia.com. Changes to flights and dates are allowed subject to re-booking fees. Changes to names are not permitted. Payment Centers- EC Pay, 7 Eleven, SM Store, Robinsons Store, Cebuana Lhuillier, Bayad Center and Payment Partners and M Lhuiller. Pay via Dragonpay payment facility. There is no additional charge when paying via this Payment facility. A non-refundable processing fee applies to payments using credit, debit or charge card. Plan your trip in advance. Plot your preferred destination and travel dates. Have a back-up dates in case your first travel date is not on promo. Be ready with the passengers’ personal details and contact information to facilitate your booking. When booking the sale ticket, secure your flights first. If later you decide to get a checked baggage allowance or pick your preferred seat, you may do this up to 4 hours prior to your flight schedule. Be armed with a lot of patience when booking. When you will be directed to the “Waiting Room, do not refresh your browser when you are there or your search will be going to a new “Waiting Room”. In case the “Waiting Room” show many times, you may log-in to mobile.airasia.com. You may also use the AirAsia Mobile App to book your tickets. 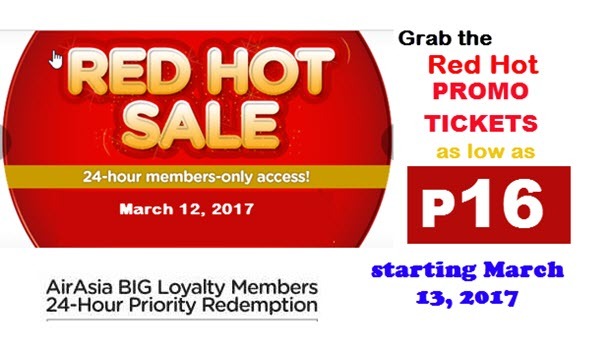 Booking of the promo tickets starts at 12:01AM March 13, 2017. However, as per our experience, it is better to book few hours after the red hot sale starts, say around 3-6AM. At 12:01AM, many will be booking and you will just stand by for a long time in the “Waiting Room”. The tickets in Air Asia Red Hot Sale 2017-2018 are LIMITED. First come, first serve basis. Book fast to secure the lowest fare! For more promo fares and PISO FARES of Air Asia, Cebu Pacific, PAL and other airlines, LIKE and FOLLOW us on Facebook: PISO FARE TICKETS!!! on august 31 afternoon flight.